Then cover the bowl with plastic wrap and set rest the dough for 20-30 minutes. Now heat oil in a pan,add cumin seeds n allow to sputter n add garlic fry lightly . Then add onions n saute till turns pink n add chopped spinach n saute for a minute n turn off the stove. 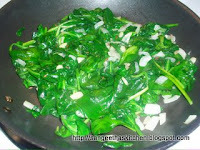 Cool the spinach stir fry n grind it to a fine paste along with 2-3 green chillies and keep aside. Now divide the dough in to 4-5 large balls. On a well floured surface keep one ball n genlty flatten it using hands n roll it to 9-10" dia make it little thick. From one edge start rolling the filled dough n seal it with pressing them lightly. Now cut in to 1 and 1/2" thickness. and on a lined or greased baking tray arrange the cur mini rolls. 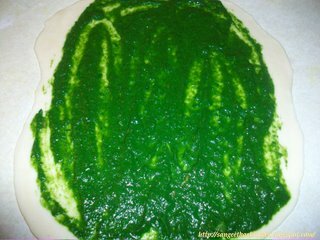 Do the same for all the remaining dough ,arrange it on a baking tray n brush it with butter/oil lightly and bake it for 20-25 minutes. or till turn crisp n golden color. 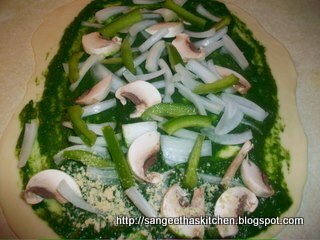 Once it done serve the Garlic Spinach snack rolls with pepper powder on top n Relish with ketchup. As this was my experiment i am not able concentrate on taking good pictures for pictorials..so sorry for that..This is so simple n you can try this with any of your desired filling.For my husband i sprinkled some red chilli flakes along with the filling since he love spicy snacks more.I forgot to brush the rolls thats the reason my rolls looks so dry.but it doesn't make a change in taste ..really so good. 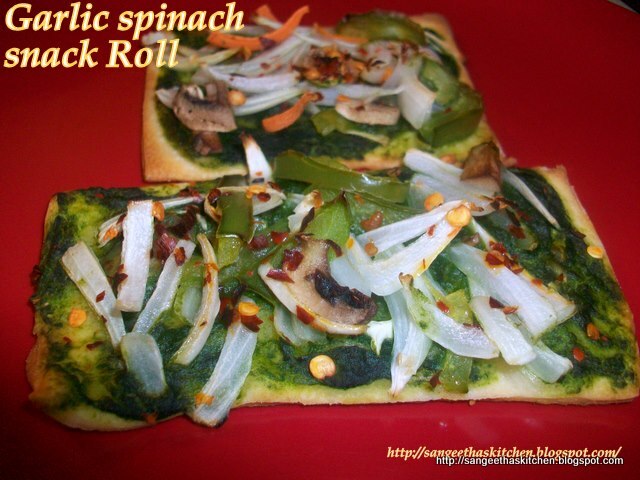 I am sending this recipe to the event , Dish It Out-Spinach and Garlic by Vardhini. 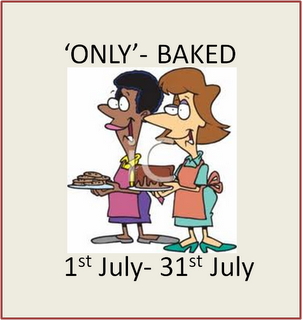 and also the new event , Only~Baked by Pari (Foodelicious) and guest hosting by Harini (TamalaPaku). 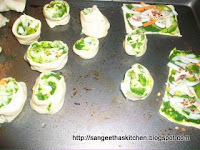 wow..yummy healthy snack..innovative idea,dear ..looks yum.. Thanks for the entry, Sangeetha. This truly is a gr8 snack for kids and adults alike!! Garlic and spinach is such a yummy combo. I can imagine how good this roll must have tasted - great idea!! so cute and perfectly done rolls !! loved them !! Very healthy and mouthwatering looking snack. Looks so inviting and uniquely made. Yummy dear .. love the color on them. Thx for linking to the event. 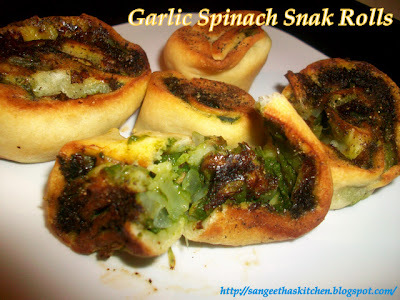 Those snack rolls looks super cute n absolutely incredible..Innovative queen Sangee neegha. lip smacking stuff sangee - yum ! Healthy Snack to make kids eat spinach.. I love your different ideas..
Hey thr...Loved the idea of using milk mawa for the dough...This ones so much easier to make than the yeast dough..Will try this out soon!!! unique and innovative rolls! sounds yummy! Love it! 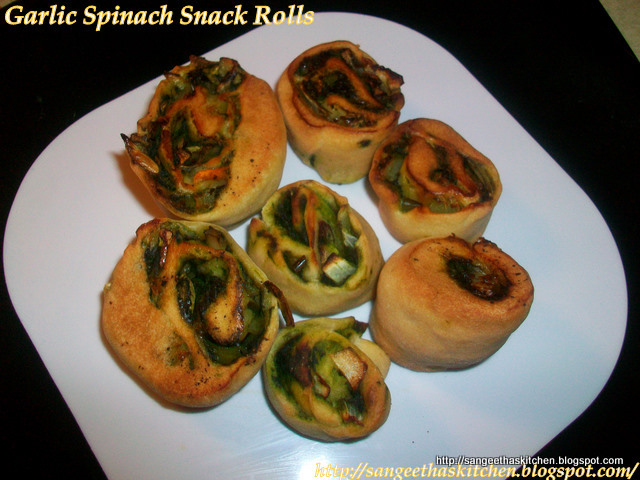 Sangee, these rolls look awesome I am sure they were a delight to eat too. Such an unique and artistic roll! I appreciate these very much. A healthy and yummy version of a snack. Praiseworthy! Healthy and yummy snack sangee!